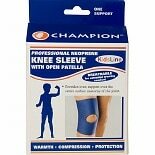 Shop Champion Kids Knee Sleeve, Neoprene (1 ea. )1 ea. 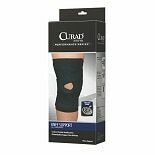 If you've suffered a knee injury, neoprene knee braces can help stabilize your knee for comfort and protection. 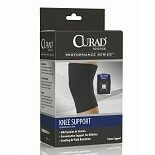 You can stay active with these supportive knee braces that help do the job that weak or injured ligaments cannot. Made from a synthetic rubber that is flexible and durable, neoprene knee braces from Champion can help you get back on your feet. Neoprene is known as an insulator. 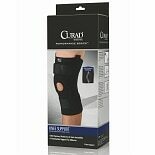 The compression and warmth that neoprene knee braces offer can help increase circulation to help heal your ligaments. Some of these supports are hinged knee braces that offer even more stable protection. Most are open around the patella to avoid putting pressure on the joint. 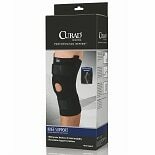 You can choose an adjustable knee brace or one in a size that specifically fits your leg. You'll also find other types of braces and supports within the aids to daily living section of our home medical department. Tape and adhesive bandages for your ankles, feet, legs, wrists and more can gently support and stabilize. Try hand braces, ankle braces and thigh braces to help stay active and avoid discomfort. Heat therapy patches can be applied to many parts of the body for pain relief. If you've had surgery, you can browse our selection of post-surgical care options, including dressings and scar treatments.